The Miami Sun Life Stadium, formerly known as Dolphin Stadium and later Land Shark Stadium, recently underwent a groundbreaking transformation. Home to many historic teams such as: The Miami Dolphins, Florida Marlins, Florida Atlantic University, and The Miami Hurricanes, the new area is unlike any other in the United States. Sun Life has been home to four NFL super bowls, the most recent being the 2010 super bowl, three BCS national college championships, two MLB world series, and the FED EX Orange Bowl. It fully encompasses the South Florida lifestyle by including nautical themes, ocean hues, and numerous amenities. Located on Dan Marino Boulevard in Miami Gardens, 16 miles west of downtown Miami and 18 miles southwest of Fort Lauderdale, it first opened in 1987 with an NFL game against the Chicago Bears. It holds 75,540 people for football events and has a seating capacity of 38,560 for baseball games. Parking is available on-site including 140 acres that holds 23,857 cars, 108 buses, 90 RVs, 225 limousines, and includes 250 disabled spaces. With the renovation comes an addition of 360,000 square feet of enclosed space, an increased number of concessions, sit-down restaurants, lounges, gathering spaces, interactive exhibits, upgraded luxury suites, flat screen HD televisions, and expanded casual seating areas in the Plaza as well as 100 and 400 levels. Sun Life Stadium has one of the largest high definition video boards, longest LED ribbon displays and one of the best wireless systems in the country. In the fall of 2007, the new and improved Club Level opened. The Club Level now includes: air conditioned VIP entrances, private escalators, flat screen televisions, Sprint fantasy lounge, lounges, bars, bistros, sit-down restaurants, meeting rooms for hosting clients and parties, cocktail stations, and state-of-the-art Kohler restrooms. The improved Club Level is a truly luxurious and decadent experience. In addition to sporting events, the Sun Life Stadium also holds numerous concerts, Monster truck rallies, and fan fests for the Marlins as well as other teams. Tickets can be purchased on-line. The Miami Sun Life Stadium is a one-of-a-kind place that is unparalleled. The 2007 renovations have transformed the it into a one-of-a-kind South Florida experience. 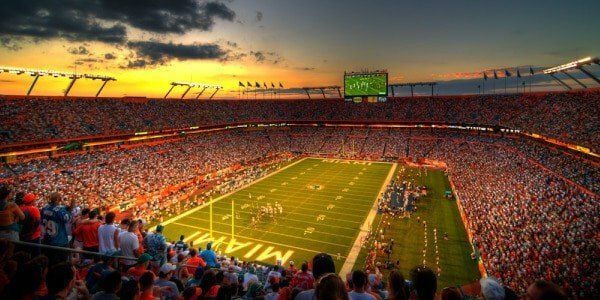 With superb amenities, events, televisions, seating, and aesthetics, the Miami Sun Life Stadium will not disappoint.